The Ski-Doo Backcountry X-RS is designed for snowmobilers who want to be in the trail and powder bound world. It’s a true 50/50 crossover. Let us report on the above. But first, know that Ski-Doo’s 2019 Backcountry lineup is no longer tied to its Renegade lineup. 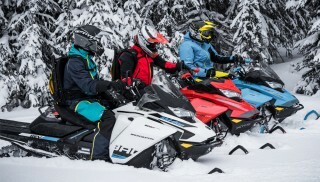 The Backcountry brand, be it the basic and standard “Backcountry” or a “Backcountry X” or the “Backcountry X-RS,” is Ski-Doo’s 50/50-crossover lineup. (Track lug height, based on track, will change this percentage.) Whereas, the 2019 Renegade lineup is more suited for trail, rough trail and crossover trail. We believe the Renegade line is 75% trail and 25% boonie masher. The Renegade line, depending on model, can come with one of Ski-Doo’s two-stroke and four-stroke motors, to include its turbocharged four-stroke motor. The Backcountry lineup is all two stroke – 850 or 600. Ski-Doo builds its Backcountry X-RS and sistership Backcountry X with the 850 only, whereas the standard/basic Backcountry receives either the 850 or 600. The 2019 Ski-Doo Backcountry X-RS is a Spring-buy crossover designed to be high-speed trail savvy as well has off-trail and cross-country smart. Colors for the 2019 Gen4 850 Spring buy-only Backcountry X-RS are Lava Red and gloss black. With its narrow Gen4 chassis, Ski-Doo’s 2019 Backcountry X-RS is crossover missile. With this chassis and 850 power, The BC X-RS is Summit-like when needed, and MXZx 600RS-like needed as well. The Backcountry X-RS comes in one length only, 146. Three track choices are available, the 15-inch wide Cobra (standard), or the 15-inch wide Ice Cobra (optional) with 1.6-inch tall paddles, or the 16-inch wide PowderMax with 2.0-inch tall lugs (optional). We recommend the PowderMax for more bite in luscious powder. To us the Cobra and Ice Cobra is Renegade territory; though good tracks, we like a crossover to be just that, a “crossover.” The PowderMax track is not a FlexEdge track like those used on the Summits and Freerides. In our opinion, the PowderMax track is the best track if the Backcountry X-RS is to be truly a 50/50 crossover snowmobile. We drove last year’s (2018) Renegade Backcountry X with the Ice Cobra 1.6 and it washed out when the snow became loose, light and deep. Likewise, last season we drove a 2018 Renegade Backcountry X, as well as this model year’s 2019 Backcountry X-RS with the PowderMax 2.0 track and this track handled loose, light and marginally deep powder. The optional PowderMax track that is 16 inches wide with two-inch tall paddles is a capable powder track for crossover work. We feel the Backcountry X-RS can spin a taller 2.25-inch track, but for a 50/50 crossover, this is sufficient. Sprocket sizes are different depending on track. The PowderMax-equipped Backcountry X-RS uses a 23-tooth small sprocket and a 51-tooth large sprocket. If a customer chooses a Cobra track, then the Backcountry X-RS relies on a 21-tooth small sprocket and a 45-tooth large sprocket. Ski stance for the Backcountry X-RS is an adjustable 38.4 inches or 40.1 inches. Our preference is the 38.4 inches, which to a mountain rider is wide, but a width that is manageable in deep powder. 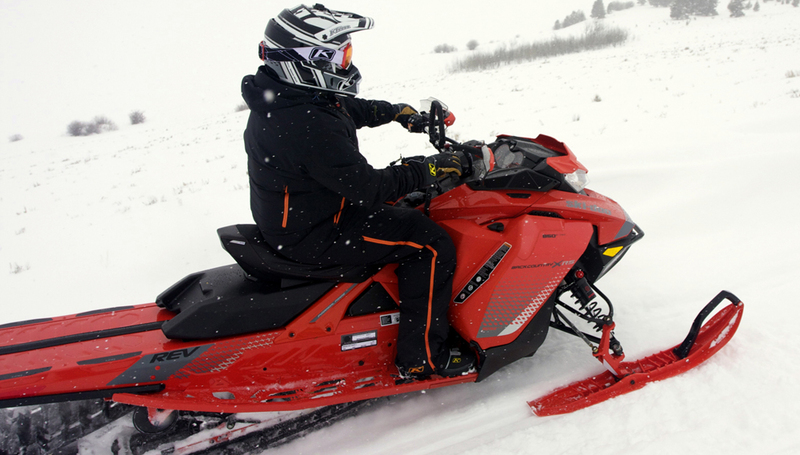 Ski-Doo has two other 146-length boondockers; the Summit SP 146 and the wild child, the Freeride 146. 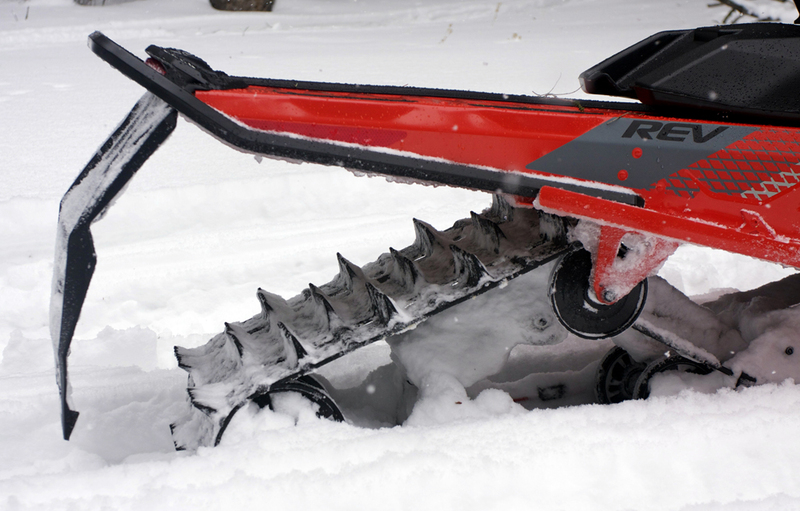 The Summit SP and Freeride come with Ski-Doo’s PowderMax II track with FlexEdge technology; lug height is 2.5 inches. These are 80% powder and steep-and-deep, and 20% trail burner. 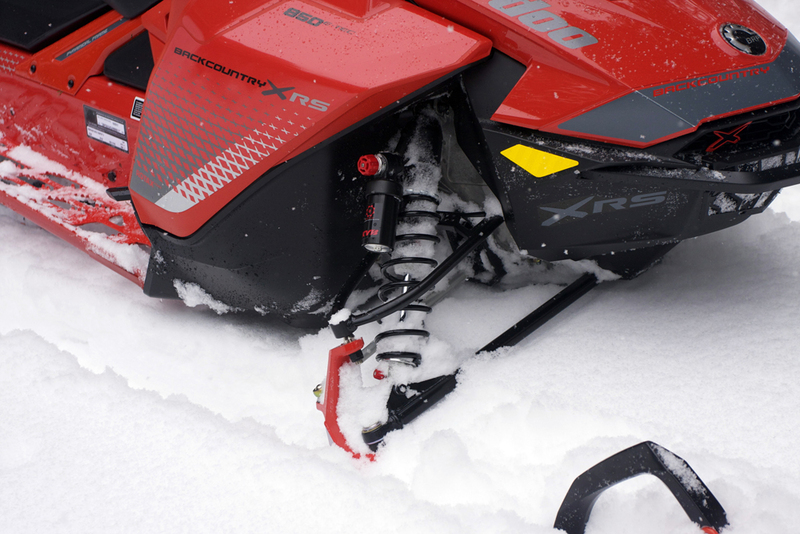 The Ski-Doo Backcountry X-RS rails along on cMotion rear suspension, which is a blend, in simple snowmobiler-speak, of Ski-Doo’s rMotion and tMotion rear suspensions; the best attributes from each. The cMotion rear suspension with KYB Pro 40 Easy-Adjust shocks and tipped up rails make this 146 long crossover snowmobile savvy, obedient to its driver, and masterful on the trails and in powder. Thus, cMotion has torque rods, springs and adjustable shocks, for trail riding – all engineered to absorb bumps like an MXZ. The cMotion’s hyfax rails, at the rear, are tipped up which allows the 146 to feel and handle like a 137 – when carving tight lines on the trails. The cMotion is a rising rate suspension, meaning as the suspension travels up into the tunnel (compresses) its springs and shocks begin to stiffen. The rising rate configuration is soft and plush at the first half of a rear suspension’s stroke, then progressively stiff at the last half of a rear suspension’s stroke – to absorb mogul slap and the rider’s corresponding down force from their body weight. For powder, the rear suspension is uncoupled (unlike rMotion, but like tMotion) which gives the rear skid permission to float and be nimble in deep powder. The center shock and rear shock on the cMotion is the KYB Pro 40 Easy-Adjust, the same as used on the MXZx 600RS sno-cross racer. The coil over KYB Pro 36 R Easy-Adjust shocks give the 2019 Backcountry X-RS permission to be cross-country- or snocross-racer like. The RAS-3 front end makes full use of these premium shocks to absorb trail hits. The RAS-3 front suspension is similar in geometry as the Summit. Skis are the Pilot DS-2. KYB Pro 36 R Easy-Adjust sit above the right ski and left ski. The front suspension is swaybar equipped. The 2019 Ski-Doo Backcountry X-RS has J-hooks and hand guards at each end of the handlebar, along with a center mountain grab bar strap. The bar’s riser block is 4.7 inches. The handlebar post is a laydown; more horizontal than the Summit and Freeride. At the foot level, the Backcountry X-RS has the famed RS running boards which are flat, wide, and built for stand up riding. The thick and reinforced boards can withstand the impact energy from hard landings, and can resist snow- and ice-buildup from deep powder play. The narrow Trail Performance seat is similar to the Mountain seat on the Summit X. This seat is grippy and cradles the sit bones quite well when in a seated position; it is a firm seat. When standing for that boondocking rush, then the seat’s purpose is to look good and be ready to catch the rider’s cheeks as they drop down. 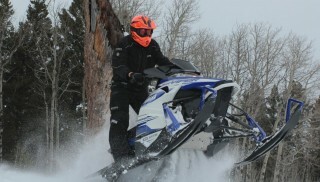 Ski-Doo did not forget style and function for the Backcountry X-RS rider. 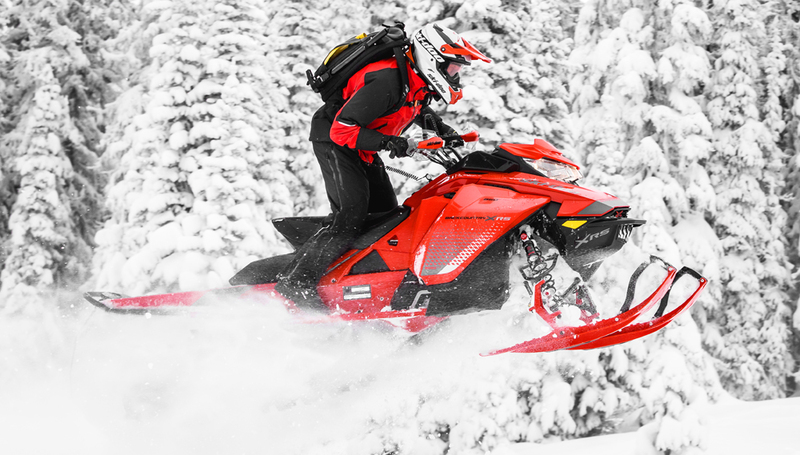 The 2019 model comes equipped with handguards, runningboards that are wide and open for snow dump, and a mountain strap for those center pulls when sidehilling. 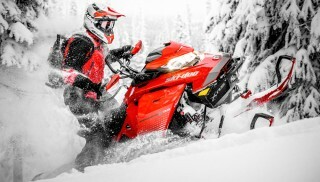 Early Spring-buy customers could have ordered their 2019 Ski-Doo Backcountry X-RS with the SHOT – Start Hot – system, or the hefty electric start system. We believe SHOT is the way to go. 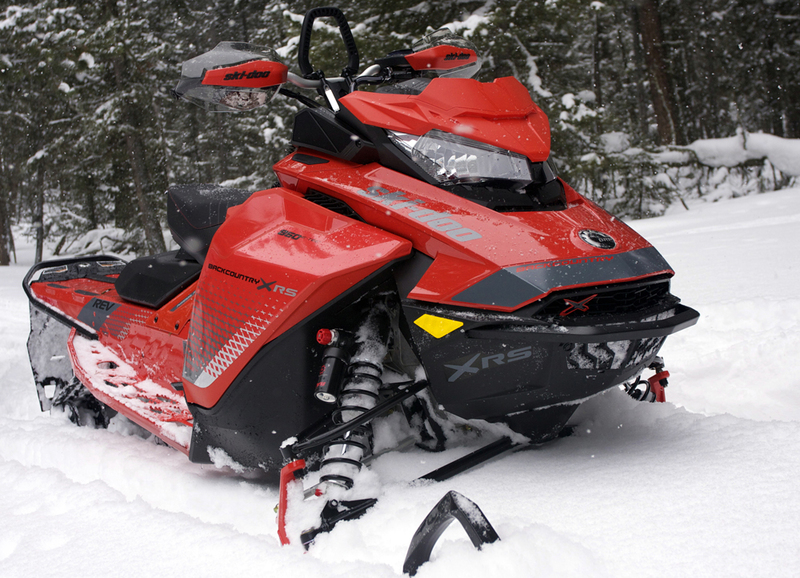 Truly, what makes the Gen-4 850 Backcountry X-RS the crosser Ski-Doo promotes as a 50/50 snowmobile? First, it has Rotax’s 850 E-Tec motor. Second, it has the fourth generation REV pyramidal chassis. Third, it has Ski-Doo’s pDrive driven clutch. Fourth, it has the RAS 3 front suspension. And fifth, it has cMotion, a rear suspension that is forgiving. From many days experience, we report the motor has a smooth hit out from the hole; the motor is wicked strong and its drive system is electric motor smooth. 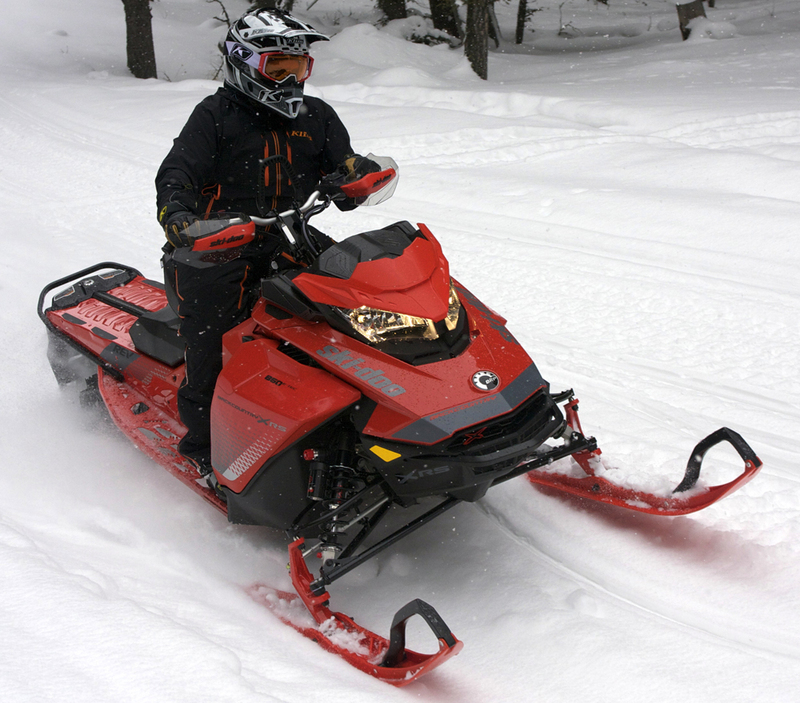 As speed and RPM build, we initiated throttle chops to manage changing terrain conditions; the nature of snowmobiling. When we would pulse the throttle lever at mid-range and above, the 850’s fuel-injection boost system helped the motor to be more than what it is; it continued shooting forward. The 2019 Ski-Doo Backcountry X-RS motor, as you know, is the liquid-cooled twin-cylinder two-stroke E-Tec motor that displaces 849 cc. The engine has electronic direct injection and electronically-controlled exhaust valves, known as eRave. The motor’s direct fuel injection system has companion booster injectors that sit atop the motor on the intake side. These booster injectors deliver to the motor “boost spray” (an air-fuel mixture) as the throttle is pulsed in mid-range or at high RPM. The boost injector system mimics (sort of to say), on a small scale a mini nitrous system; the concept is the same, minus the liquid nitrous. This system is tied to throttle position, RPM and exhaust valve position. The 849cc Rotax builds it 165 horsepower at an optimum 8,000 RPM, while pumping out 106 lb-ft of torque, approximately. The Backcountry X-RS is a planted crosser on whippy and choppy trails. When powering through sharp bends with moguls, it leaves the driver to control the situation, not the other way around. We found it to be an obedient crossover. On hillsides, when the snow is packed, the Backcountry XR-S with its ski stance at its widest is not easy to pull up edge; its sway bar wants to keep the front end down and planted; at times, too planted. Though in 12 inches of powder and more, the 2019 Ski-Doo Backcountry X-RS converts into a powder critter. Here again is our recommendation, when playing In good ol’ powder on a mountain side; cinch in the ski stance and soften front shock pre-load. On the other hand, for cross-country exploring and meadow cruising through trees and on gentle rolling hillsides, the factory-set ski stance and marginally firm shock load is quite all right. 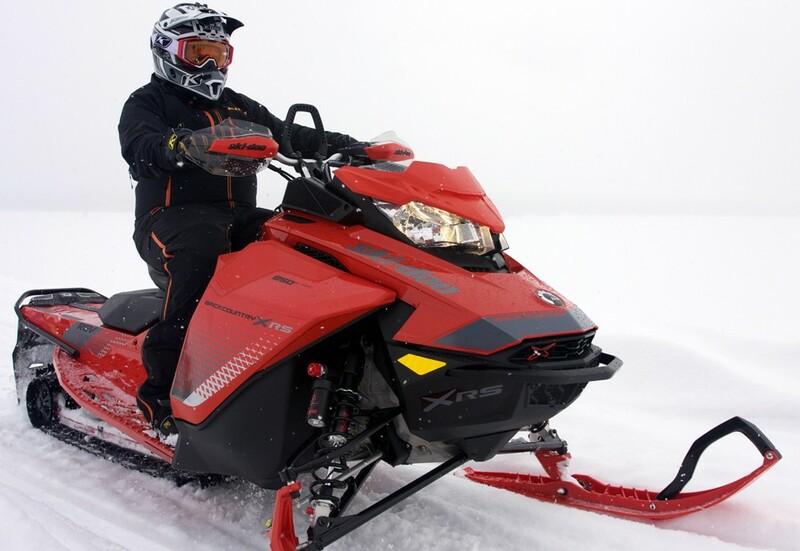 It may be a crossover snowmobile, but for backcountry exploring, the Backcountry X-RS is suitable for long rides with its hybrid ergonomics from the Summit and MXZx. The 146-length G4 Summit and Freeride 146 are good trail machines, more powder suited, but not fastened to the trail like the Backcountry X-RS; this is the Backcountry X-RS’ purpose: fast and stable.